Much has been written about last week’s story of the parents who received a ‘no-show’ invoice after accepting a party invitation for their son and then failing to attend. This rather petty squabble between parents has managed to hit national news and capture the attention of many, with most reports, comments and articles I’ve read seeming very much to take the angle that sending such an invoice is really quite ridiculous. But whether or not that’s the case, doesn’t anyone else think Mrs Lawrence has a point? She may not have chosen the best way to make her point, but I think she has a very good one nonetheless. 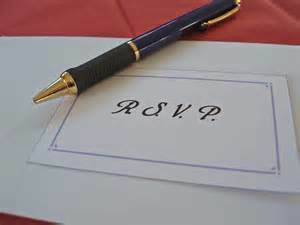 Newsflash: Accepting an invitation to a party then not showing up is rude. Sorry, but there it is. Or perhaps the craziness of kid’s parties nowadays, that this little episode has set everyone squawking about, includes the decline of basic social norms, the loss of societal etiquettes that include consideration of other people. The excuse the parents gave for the no-show was, frankly, lame. And no apology or explanation to the host either. Not OK.
And yet these parents appear to be so totally unashamed of their behaviour that they are willing to talk to the national press, brazen-faced pictures of father and son with the offending invoice appearing everywhere, with a video to boot, as if they are entirely the victims here, the fault all on the side of the parent who had the nerve to remind us all of those seemingly long-lost laws of common courtesy. The inclusion of the child in the photos and video I find particularly inappropriate. What kind of lesson does this teach a child? Because when adults behave badly, they teach children to behave badly too. We can’t be perfect all the time, but really, let’s try to be a little more mindful of the kind of role models we’re all providing for the next generation. Let’s try to teach our children about being considerate and respectful towards other people, about resolving issues using a little emotional intelligence and maturity, and yes, a little basic common courtesy. But coming back to the general squawking about kids parties, Zoe William’s article in The Guardian is a great example of this. She complains not just about the cost of hosting the party itself, including the venue, the entertainers and the party bags, but the cost of buying presents when you’re invited to one. Well boo hoo. Here’s an idea – how about you don’t spend £20 on a gift voucher from Next for Christ’s sake, and just get a book online for less than a fiver? When Ms William’s ready-made £3-a-piece party bags failed to arrive, she went shopping in John Lewis instead. “Don’t even ask how much that cost”. Really? John Lewis? Sorry, but I’m struggling to have much sympathy with such middle-class lack of resourcefulness and imagination. How about trying Poundland? Or better still, we all just stop doing party bags? Whose idea were these anyway and when did they start? A bag full of rubbish the kids will immediately break or lose in their quest to get to the only thing it contains that they really want – the slice of birthday cake. People will just go along with these things whilst bleating about ‘pressure’ and ‘guilt’. The only thing forcing parents to spend so much time, effort and money on kids parties is the parents themselves. And how does all this excuse Mr Nash’s behaviour? When my child was in reception one of the parents invited the whole class to a party. She later told me that only half those people bothered to even reply to the invitation, which clearly stated RSVP. Call me old-fashioned if you like, but I think that’s just shocking. You may think the parent was mad to invite the whole class, but that’s not the point here, not an excuse for rudeness. Similarly, the cost of the party Mrs Lawrence chose to host is not the point. Yes, in choosing to host a party you take the risk that you end up paying for more people than actually turn up. That’s always a risk with any party. But it’s a risk because people can simply be downright rude and inconsiderate, and for this there really is no excuse. This entry was posted on Thursday, January 29th, 2015 at 4:21 pm and is filed under Media & current affairs. You can follow any responses to this entry through the RSS 2.0 feed. You can leave a response, or trackback from your own site. 2 Responses to Is common courtesy a thing of the past? I can’t stand the whole party ritual thing either, and I too wish party bags would quietly disappear. My summer-born kid gets a picnic in the park, I do food and drink including some booze for adults, and that’s it, the rest is up to them. We ask most of the class and many don’t show but that’s OK. I make clear presents are optional and should be tiny if at all; some parents just bring £5/£10 towards costs. Left over food gets used by us on following days. Luckily, we are at the kind of school at which very few kids would expect the full-blown performance, most probably get a cake and maybe one present at home, en famille, if they’re lucky. Sounds good to me. I still think if people are invited they should have the courtesy to either accept or decline, but I guess when you’re not paying £15 per head this is less of an issue!